Join us at the only conference for rural housing associations, local authorities and stakeholders. This year’s conference promises to be bigger and better than ever before. 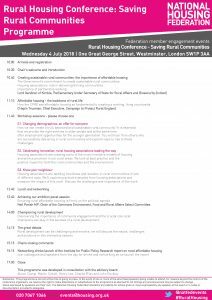 from the need to influence policy and increase development to showcasing housing associations’ innovative solutions to delivering sustainable rural communities. • collaborate with others to gain political support to address rural issues. S1. Changing demographics: an offer for everyone How can we create a truly balanced and sustainable rural community? It’s essential that we provide the right services to older people, and at the same time offer employment opportunities for the younger generation. You’ll hear from others who are successfully delivering in rural communities and explore ways to rise to these challenges. Housing associations are creating some of the most innovative models of housing and service provision in our rural areas. We look at best practice and the positive impact for both the rural communities and the environment. S3. Know your neighbour Housing associations are tackling loneliness and isolation in rural communities in lots of different ways. We’ll explore practical examples from housing associations and measure the impact of this work, discussing the challenges it brings. Don’t miss out on this unique opportunity to network with your rural colleagues at the only rural conference for housing associations, local authorities and rural stakeholders. Join us after the conference for networking drinks as we launch the Institute for Public Policy Research report on rural affordable housing. Please note this conference is value added tax (VAT) applicable. Listed prices are exclusive of VAT.